Hyundai Motor India Ltd. (HMIL), the country’s second largest car manufacturer and the number one car exporter since inception, announced the Nationwide ‘Free Car Care Clinic'. The customer connect program began on April 12 and will continue till April 21, 2019, at all Hyundai dealerships and service points across India. The Nationwide Free Car Care Clinic will offer customers a wide range of services and benefits including discount on parts & labor, Road Side Assistance Retail Program, VAS Products, Special Discounts on giving Referral. To make it more fun and endearing, Hyundai is offering attractive deals to its customers such as “Family Sunday” for customers who have their or any of their family member’s birthday (Spouse/Kids/Parents) during this period, can visit the workshop on Sunday during FCCC and on producing a valid Date of birth document will entitle them to avail an additional discount of 10% on Mechanical Labour. Additionally, keeping in view the ongoing general elections any Indian citizen and a Hyundai customer who has voted can avail an additional discount of 10% on Mechanical Labour on showing the Election Ink mark on their finger. Keeping in line with Hyundai’s commitment to deliver customer delight and exceptional service quality, the theme of this year’s ‘Free Car Care Clinic’ is an extension to our service slogan – Right Here Right Care. 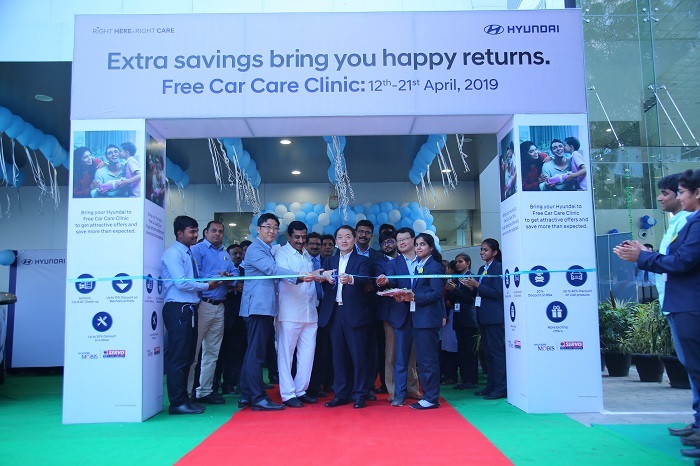 Hyundai Motor India Ltd. (HMIL), the country’s second largest car manufacturer and the number one car exporter since inception, announced the Nationwide ‘Free Car Care Clinic'.